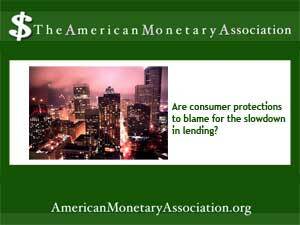 What’s Behind the Lending Slowdown? Interest rates are still low, the housing market is rebounding, and employment stats are better – so why are loan approval rates down and fewer applications being processed? Financial experts point to a combination of factors stemming from the freewheeling days of the pre-crash housing market and the lawsuits and legislation that followed. As more consumer protections for borrowers are enacted, some finance watchers say banks are taking steps to protect themselves. The wild spree of mortgage lending that contributed to the housing collapse of 2008 put loans in the hands of unqualified buyers who fell into default. That scenario, combined with documented abuses in handling the resulting flood of foreclosures later on, paved the way for the string of lawsuits and legislation aimed at protecting borrowers and forcing major lenders to clean up their act. Now. According to a recent Forbes post, those very protections may be strangling banks’ willingness to lend. Major lenders lost big money in the housing collapse, and still more from settlements relating to the robosigning scandal and other fraudulent practices. Although Bank of America and its codefendants have only themselves to blame in those lawsuits, the pressure is on now to stop losses related to mortgage defaults. That means screening potential borrowers especially carefully. New regulations on mortgage lending practices are being implemented, too. The Dodd-Frank Wall Street Reform Act of 2010 was enacted to reform mortgage-lending practices and put protections for borrowers in place. Some of those provisions are already in place, requiring lender transparency and imposing time frames on handling the loan application process. Still others, including the new Qualified Mortgage Rule, won’t take effect until 2014, making banks leery of ramping up future loan activity. The new regulations designed to protect loan applicants from predatory and fraudulent banking practices also create conditions for consumers to sue lenders for violating a variety of those provisions or, for approving the mortgage in the first place. That creates an atmosphere of caution, as banks impose still more protections into the loan process. Advocates of Dodd Frank and critics of major lenders behavior in the aftermath of the scandals point out that these banks are hardly the victims they paint themselves to be. But the history of mortgage lending since the crash has created an adversarial relationship between borrowers and lenders that isn’t likely to disappear any time soon. Finger, Richard. “Banks Are Not Lending Like They Should, and with Good Reason.” Forbes, 29 May 2013.